BOTH Riz Ahmed and Dev Patel are just two of the many stars who will line up at this year’s Toronto International Film Festival which starts today (September 6). www.asiancutlurevulture.com is in Toronto and will be covering the festival. It is the first time acv has attended what is the largest film festival of its type in North America. The fest has drawn a huge array of stars and film personalities from around the globe – and we will be covering the films and personalities of interest to a South Asian audience. Patel has two films here, and the different films enjoy world premieres – ‘Hotel Mumbai’ is a meant to be both a thrilling and harrowing depiction of events as they unfolded on the evening of November 26 2008, when terrorists ran amok in Mumbai. That night five heavily armed and well trained young men slipped into Mumbai from the sea, murdered 166 in all, injured hundreds more and three lay siege to the Taj Mahal Hotel for around three days before being killed themselves by Indian commandos in a final push. 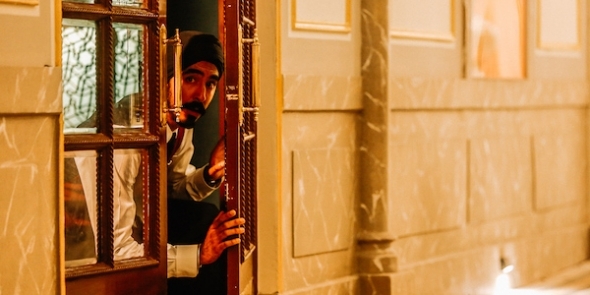 ‘Hotel Mumbai’ is adapted from the Channel 4 documentary, ‘Surviving Mumbai’, in which hotel guests recount heroic tales of dodging bullets, bombs and fire to live to tell the tale. Patel plays a Sikh hotel worker and Anupam Kher is another of the stars to appear in the film. Made by Aussie feature film debutant Anthony Maras, it premieres on Friday (September 7) and acv will be there. ‘The Wedding Guest’ is the latest film from acclaimed British indie director Michael Winterbottom and it is an intriguing and mystery-laden tale of a man (played by Dev Patel) who leaves Britain for Pakistan, gatecrashes a wedding and offers a bride there an unusual choice. Patel is opposite one of the rising stars of Indian cinema, Radhika Apte, who had a part in the Netflix smash, ‘Sacred Games’. Riz Ahmed is expected to make an appearance with his latest film, ‘The Sisters Brothers’. Directed by Palme d’Or winner Jacques Audiard, it is a subversive cowboy tale in which Ahmed plays the target of the sisters’ brothers. It has its North American premiere here this Saturday. Also here is Abhishek Bahchan who returns to films after a hiatus. He is one of the stars of indie director Anurag Kashyap’s ‘Husband Material’ or ‘Manmirzyaan’. Kashyap has emerged as one of the great auteurs of Indian cinema in recent times, and continues to alter the language of popular Indian cinema. Also here from India is ‘Manto’ (see acv YT), ‘Bulbul can sing’, (a new film from Rima Das, who enjoyed a lot of success with ‘Village Rockstars’, which also screened at last year’s TIFF); ‘Reason’ a new and urgent magnum opus from the incomparable Indian documentary filmmaker Anand Patwardhan. It has a world premiere on Saturday (September 8). Vasan Bala is another name familiar to anyone who has followed independent Indian cinema in recent times. His first feature, ‘Peddlars’, premiered in Cannes. Now he comes to to TIFF with a comedy spoof (very different from the Mumbai drugs underworld ‘Peddlars’ covered), ‘The Man who does not feel pain’. It enjoys a world premiere on Monday (September 10). ‘The Sweet Requiem’ is a tale about a Tibetan refugee trying to survive in India, and is according to Cameron Bailey, TIFF artistic director, “enlightening in revealing a side of the refugee crisis we rarely get to see”. It has its world premiere here on Sunday (September 9). Not listed as an Indian film but with a strong storyline based out of Goa is ‘Maya’. Director Maya Hansen-Løve is regarded as one of Europe’s most up and coming directors and is thought not disappoint as she chronicles the tale of a French jaded war correspondent who finds himself falling for an Indian girl called Maya. Its world premiere is on Monday. Keep tuned and look out for some special interviews! Make sure you’re connected with us TWITTER, FACEBOOK, INSTAGRAM.